Pointwise, Inc. is solving the top problem facing computational fluid dynamics (CFD) today – reliably generating high-fidelity meshes. The company’s Pointwise software generates structured, unstructured and hybrid meshes; interfaces with CFD solvers such as ANSYS FLUENT, STAR-CCM+, OpenFOAM®, and SU2 as well as many neutral formats, such as CGNS; runs on Windows, Linux, and Mac, and has a scripting language, Glyph, that can automate CFD meshing. Large manufacturing firms and research organizations worldwide have relied on Pointwise as their complete CFD preprocessing solution since 1994. The Pointwise software was introduced in late 2007 and builds upon the legacy of the Gridgen software that Pointwise’s co-founders began work on in 1984. Pointwise is a complete CFD preprocessing solution. Interface with your geometry modeling software via file exchange using native, standard, and neutral formats. Use both parametric (e.g NURBS) and faceted (e.g. STL) geometry models, even within the same mesh. Apply either of two strategies for dealing with gaps and overlaps in geometry models: heal the mesh over gaps or assemble watertight solid models. Generate multi-block structured, unstructured, hybrid, and overset meshes. Pointwise’s T-Rex technique generates hybrid meshes with near-wall prism or hexahedral resolution of boundary layers. Automate and customize mesh generation to your organization’s processes and best practices by writing templates and macros using Glyph, Pointwise’s scripting language. Use Pointwise’s plug-in API to add import and export functions for mesh and solver data in your preferred format. For more information, visit www.pointwise.com/pw. Another Fine Mesh is a blog about mesh generation, computational fluid dynamics (CFD) and all things related (and some things not). It is written by us folks at Pointwise where we’ve been developing mesh generation software for CFD since 1994 (and some of us a lot longer). AFM is a forum for discussions about computer aided engineering and how it impacts both us and you. We’ll share our thoughts on computer hardware and software, industry events and personalities. Yes, we’ll also write about what we’re doing, what we’re thinking, and where we’re going. We invite your comments on all of it. Contact us at blog@pointwise.com. My name is Nicholas Tsagarakis and I am currently a student at Music Technology and Acoustics department in Greece. I would like – if it is possible, to have the permission to use a picture from your blog, in my thesis’ presentation. If it is a problem for you, please do not hesitate to refuse. 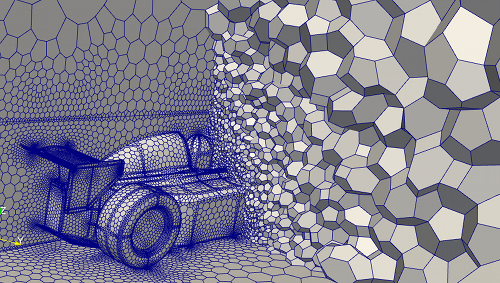 I’m curious: why is a music technology student interested in polyhedral meshes? Interesting question. That is actually because the subject of my thesis is about the Finite Element Method, in the field of Acoustics and Vibrations. That sounds like an interesting topic. I’d like to learn more when you’re finished. I made some educational examples about vibrating solids, and mostly using eigenfrequency analysis. I suppose because of the “educational” topic, you wouldn’t have something to learn from that. However it happens to be in English (instead of Greek), so I will definately remember your request. Hello again. So this is my final thesis https://dl.dropboxusercontent.com/u/55300291/TsagarakisNikolaos2014.pdf you could take a look or use it however you want. It’s separated in 3 parts, unfortunately the theoretical part is quite big because as I mentioned previously, it’s been written for educational causes mostly. Thanks. It’s on my reading list.